The UN Guiding Principles on Business and Human Rights (UNGP) expect companies to participate in non-judicial mechanisms to address the grievances of communities. In the context of a factory, this grievance mechanism should enable workers to engage in a social dialogue with management and create a system for factories to identify and then rectify workforce challenges. As companies look to implement the (UNGP) and comply with increased regulatory pressures, such as the UK Modern Slavery Act and California Transparency in Supply Chains Act, they must look to assess the effectiveness of such grievance mechanisms as due diligence and risk management tools and report impact over time. We’ll discuss industry best practice and how a robust grievance mechanism should enable remediation where required and can help to support better communication in the workplace resulting in more effective business driven sustainability practices. We will share the ELEVATE experience managing two grievance mechanisms on large-scale programs, one in Bangladesh and the other in Malaysia. 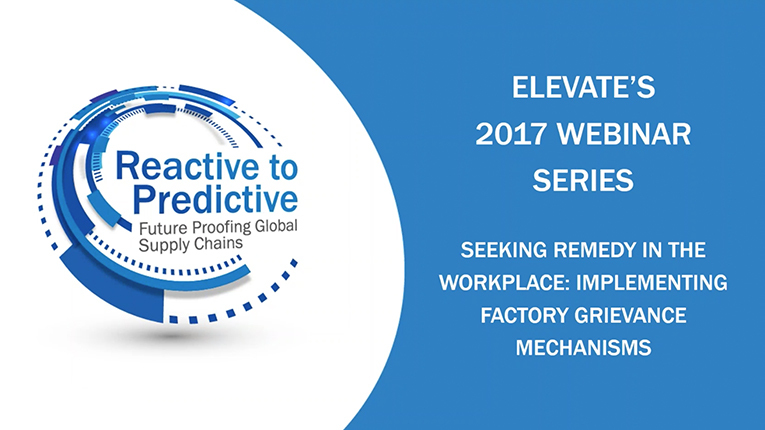 We will also share details of a new global ELEVATE tool we’re rolling out in the 2nd quarter of 2017—making its debut in China.